Provides an economical, high performance through-the-wall solution with the look and feel of an actual bank ATM. Designed and built with compact modular components and engineered for easy installation and reliable operation. The T4000 includes a host of high-end features including a 10.4� Sun-Viewable Color LCD supporting custom screen advertisements and communication via 56K Modem or integrated Ethernet (SSL). 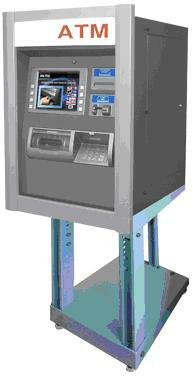 A rear-service panel allows convenient and safe access for ATM Operators and Service personal.